Letitia lived in the same house where her grandmother and her great-grandmother had lived and died. Her own parents died when she was very young, and she had come there to live with her Great-aunt Peggy. Her Great-aunt Peggy was her grandfather's sister, and was a very old woman. However, she was very active and bright, and good company for Letitia. That was fortunate, because there were no little girls of Letitia's age nearer than a mile. The one maid-servant whom Aunt Peggy kept was older than she, and had chronic rheumatism in the right foot and left shoulder-blade, which affected her temper. Letitia's Great-aunt Peggy used to play grace-hoops with her, and dominoes and checkers, and even dolls. Sometimes it was hard for Letitia to realize that she was not another little girl. Her Aunt Peggy was very kind to her and fond of her, and took care of her as well as her own mother could have done. Letitia had all the care and comforts and pleasant society that she really needed, but she was not a very contented little girl. She was naturally rather idle, and her Aunt Peggy, who was a wise old woman and believed thoroughly in the proverb about Satan and idle hands, would keep her always busy at something. If she were not playing, she had to sew or study or dust, or read a stent in a story-book. Letitia had very nice story-books, but she was not particularly fond of reading. She liked best of anything to sit quite idle, and plan what she would like to do if she could have her wish—and that her Aunt Peggy would not allow. Letitia was not satisfied with her dolls and little treasures. She wanted new ones. She wanted fine clothes like one little girl, and plenty of candy like another. When Letitia went to school she always came home more dissatisfied. She wanted her room newly furnished, and thought the furniture in the whole house very shabby. She disliked to rise so early in the morning. She did not like to take a walk every day, and besides everything else to make her discontented, there was the little green door, which she must never open and pass through. The house where Letitia lived was, of course, a very old one. It had a roof, saggy and mossy, gray shingles in the walls, lilac bushes half hiding the great windows, and a well-sweep in the yard. It was quite a large house, and there were sheds and a great barn attached to it, but they were all on the side. At the back of the house the fields stretched away for acres, and there were no outbuildings. The little green door was at the very back of the house, toward the fields, in a room opening out of the kitchen. It was called the cheese-room, because Letitia's grandmother, who had made cheeses, had kept them there. She fancied she could smell cheese, though none had been there for years, and it was used now only for a lumber-room. She always sniffed hard for cheese, and then she eyed the little green door with wonder and longing. 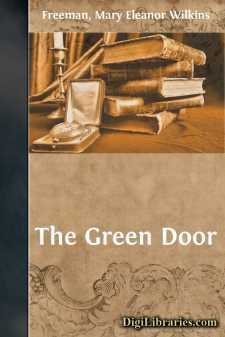 It was a small green door, scarcely higher than her head. A grown person could not have passed through without stooping almost double. It was very narrow, too, and no one who was not slender could have squeezed through it. In this door there was a little black keyhole, with no key in it, but it was always locked. Letitia knew that her Aunt Peggy kept the key in some very safe place, but she would never show it to her, nor unlock the door.